Android Jelly Bean 4.2 is inarguably the best version of Google’s mobile OS to date. As well as being almost as smooth as its Cupertino rival thanks to the heavily-publicized Project Butter, it provides a vast array of functions which many users on older generations could usually only dream of. However, considering the vast majority of Droidsters are on older software, and with some of the more antiquated handsets having little to no hope of seeing any of Jelly Bean’s niceties any time soon, developer AntTek has sought to bring one newer feature to those languishing on Android 2.1 – 4.1. 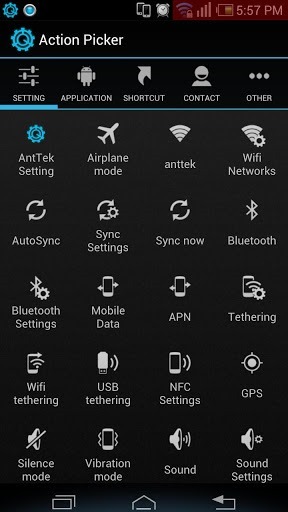 Named AntTek Quick Settings, it brings Jelly Bean’s useful quick setting feature to any device running on the aforementioned software versions, and with no root required whatsoever, this one is truly accessible to everybody. 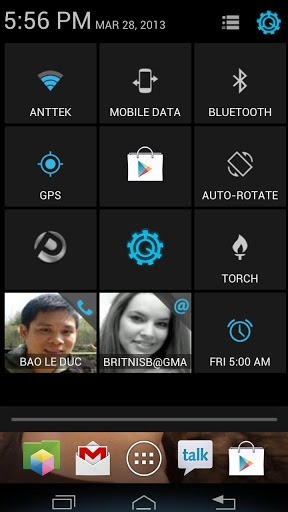 The immediately striking thing about AntTek Quick Settings are the beautiful clean toggles available. With a simple tap, you can activate / disable your Wi-Fi, mobile date, Bluetooth, tethering, GPS, Airplane Mode and more, and there are also convenient settings to tweak the sound / brightness to your precise requirements. Although this app is supposed to emulate the experience of the Jelly Bean Quick Settings feature, it’s actually a great deal more than that. The Quick action feature is integrated with your music app allowing you to skip, play/pause with minimal fuss, as well as access features like battery, direct dial and camera with relative ease. In fact, even if you are on Jelly Bean 4.2, this app can be used in a supplementary manner to the native offering, and with over 60 actions packed into this AntTek Quick Settings, you’re device will be swamped with configurable options; not a bad thing. All you need to do to get started with the app is pull it down from the top/right corner of your device’s display, and tap on an action. The interface is comprised of a beautiful, Holo design, and with different themes also available, you can adjust it to suit your aesthetic tastes and preferences. There’s a free version and a Pro version, the latter of which costs a shade under two bucks.